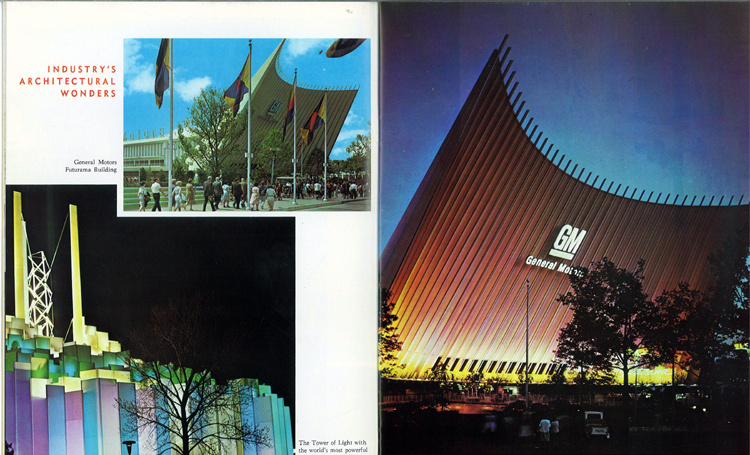 The Cooper-Hewitt Library has a large collection of over 2,000 World’s fair catalogues and books. Many are the official guidebooks that visitors could purchase with descriptions of pavilions and that helped locate sights and other points of interest. 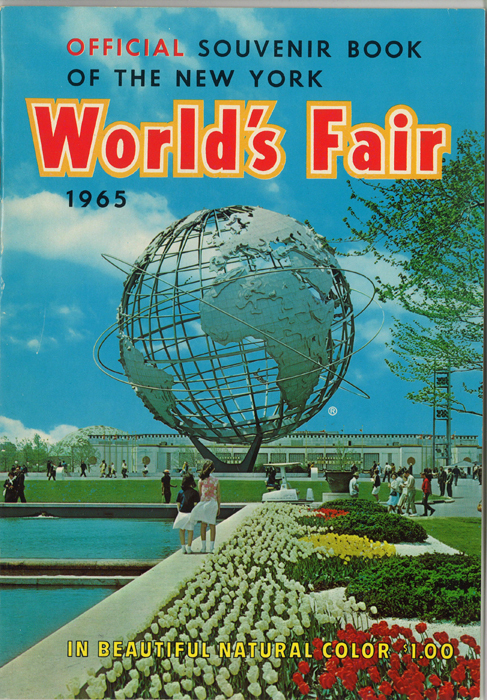 As a teenager, my mother had loved the 1939 World’s fair, so that when it came to New York City again in 1964-65, she wanted to see another World’s fair and have us children experience the same excitement and wonder. It was a long subway ride from Brooklyn through Manhattan to Flushing Meadows in Queens, the same site of the ’39 fair. I bought a special “World’s fair “outfit” to wear every time I went; a blue skirt and an orange top- the official colors of the fair. The theme of the fair was “Peace Through Understanding”, dedicated to “Man’s Achievement on a Shrinking Globe in an Expanding Universe”. We talked about the Fair in school, sang the UNICEF theme song in Assembly – “It’s a small world after all”, and learned about the different countries and American companies that had pavilions at the fair, like the General Motors Pavilion. 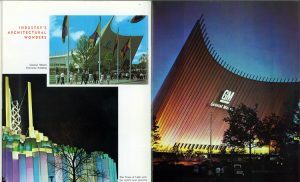 My memories of the Fair are mostly visual, glimpses of this or that pavilion, but what was most iconic, visible and still survives is the Unisphere. 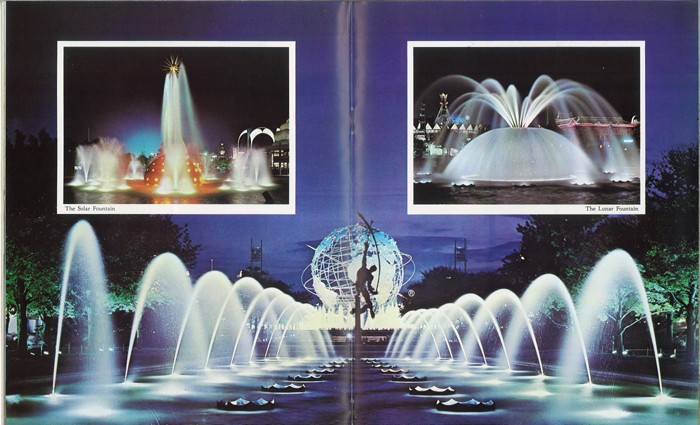 Fountains at the 1964-65 New York World’s Fair. 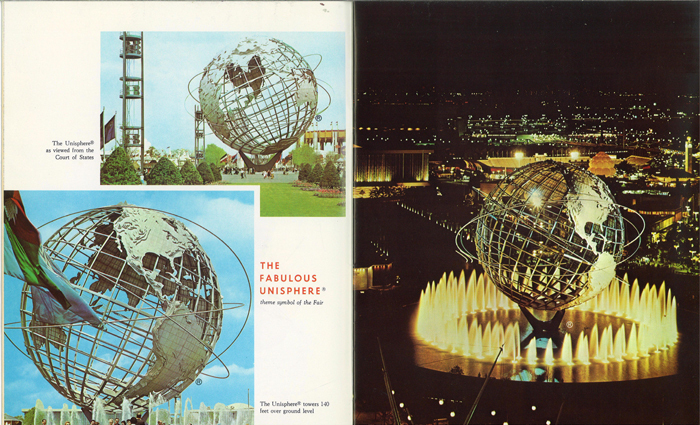 The Unisphere may be scene in the back in the bottom photo. Looking longingly at the Belgian Pavilion, I wanted a Belgian waffle desperately, but never had one. I most vividly remember waiting until dark to see the fountains and colored lights and music. This was better than the 4th of July! The Fountain of the Planets, sent up 10,000 tons of water in shifting patterns, sometimes as high as 150 feet into the air, and the jets of water were synchronized with the fireworks, lights and music. 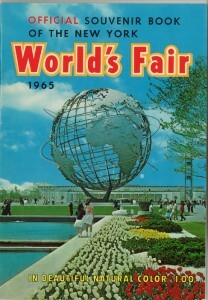 This was the only World’s Fair that I’ve ever been to. It opened on April 22nd, 1964 and tomorrow marks its 50th Anniversary.